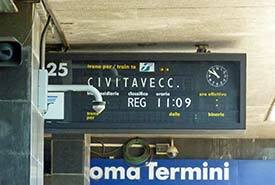 How to reach Rome Termini, Trastevere, and other stations by commuter train from the cruise and ferry port of Civitavecchia. ABOVE: The façade of Civitavecchia's railroad station, which is within walking distance from hotels and the cruise port. 1. 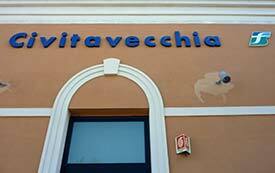 Go to Civitavecchia's railroad station. 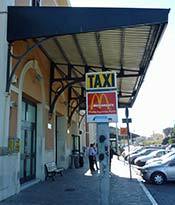 LEFT: Civitavecchia's railway station is a short bus ride from the port. From your ship, take the free shuttle bus to the stop outside the port walls. There, you can catch an inexpensive shuttle bus to the train station. If you want more detailed directions or a printed map, stop at the tourist office's Infopoint kiosk at the shuttle-bus stop. 2. Choose a station in Rome. ABOVE: A No. 8 tram to the city center passes Trastevere Station in Rome. Most trains from Civitavecchia to Rome complete their journey at Roma Termini, the city's main railroad station and the hub of Rome's public-transportation network. 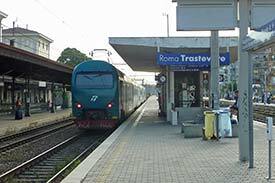 However, many trains also stop at intermediate stations such as Roma San Pietro (close to the Vatican) and Roma Trastevere (where you can catch the No. 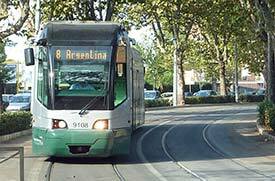 8 tram to the Centro Storico). Depending on where you're headed, you may prefer to finish your journey at one of these stations. In the station, look for a yellow Partenze (Departures) table that shows train times and platforms. Or click here to view printable timetables in PDF format (courtesy of Massimo Rimondini) and check the platform number when you're in the station. Trains depart for Rome at least twice an hour from early morning until late in the evening. Nonstop trains take about 45 minutes to reach Roma Termini; commuter trains, which stop at intermediate stations, usually require 1 hour 15 minutes or longer to cover the same distance. At the station newsstand. This can save time if there's a line at the ticket counter. 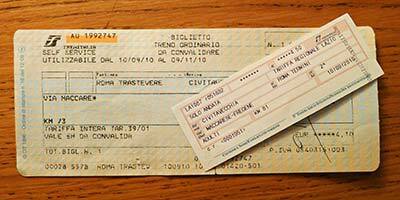 Please note: You do not need to buy tickets online before your arrival in Civitavecchia. The Civitavecchia-Rome line is a commuter route, with plenty of departures and no reserved seats on trains. 5. Find the platform, stamp your ticket, and board your train. Look for a yellow Partenza (Departures) table or an electronic sign in the railroad station to find the platform number for your train. Important: When you reach the platform, validate your ticket in the yellow stamping machine before boarding the train. Otherwise, the conductor can charge you a hefty fine. 6. Get off at the correct station in Rome. ABOVE: A train arrives in Roma Trastevere station. If you're going to Roma Termini, just stay on the train until it reaches the end of the line and everyone gets off.